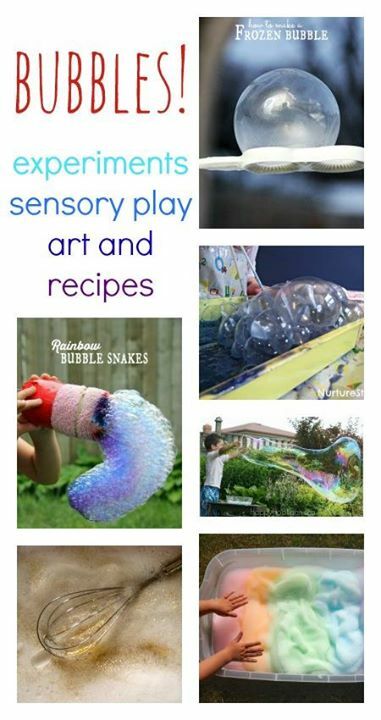 Here’s a collection of brilliant bubble play activities you can try, with great bubble mix recipes and bubbly sensory play ideas. We love playing with bubbles! It’s so easy to keep a little pot of bubble mix in your bag, ready to bring out for fun and giggles, and they always make my girls smile. :: Try this homemade bubble recipe to get the fun started – and see if you can blow some giant bubbles. :: For super frothy bubbles that are great for a sensory tub, take a look at which kitchen gadget you need to make this colourful bubble foam. :: If your children have sensitive skin, or you’re concerned about them swallowing some of the mixture, you could try this soap free bubble mix. :: Or challenge your children to see if they can blow a bubble with their hand. :: Aside from the fun of simply blowing, chasing and popping bubbles, you could try this technique to make some bubble paintings and prints. :: Did you know it’s possible to make frozen bubbles? :: A pot of bubbles are great to give as gift or party favour. You could use this printable bubble mix label to give your bottle some style. Get free resources for your children! Did you know you can receive free weekly activity ideas, seasonal resources, free printables and extra bonuses from Nurturestore? You'll have creative learning ides for your children all year round! Sign up in the box below and we'll send you your freebies!